Most of us agree that animals should never be in zoos. But when they are, the least a zoo can do is keep them safe. That goes especially for zoos that count some of the world's rarest animals as part of their menagere. Unfortunately, officials at the Dudley Zoo in Dudley, United Kingdom didn't see it that way. 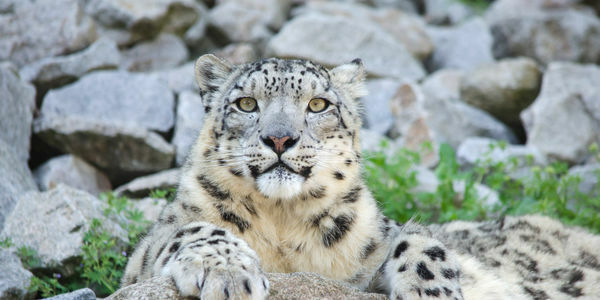 The zoo was home to one of the rarest cats in the world, a snow leopard named Margaash. If you've never seen one, Google it now. They have long silky silver fur with dark spots and a snowy white underbelly. The cats number as few as 3,500 and are so scarce that few people have seen them in the wild. Dudley Zoo was one of only a few hundred zoos that had one in captivity. That was until last month when an irresponsible zookeeper left Margaash's pin door open and he escaped. But instead of doing all they could to bring Margaash back to his enclosure, they assembled the firearm team and shot him dead. This news is heartbreaking. That a zoo would be take the life of such an amazing creature, all because of human error, is almost inexcusable. The zoo says that "euthanasia is, and always will be, a last resort," but that doesn't seem like it was really the case. They had the option to use a tranquilize the cat but instead decided to end its life. We hear about the horrible stories of animal abuse, neglect and negligence again and again at zoos all around the world. More often than not, these stories end with the animal paying the ultimate price, just as Margaash did. Dudley Zoo is no different from the host of others who have no business housing animals in captivity for the sole purpose of using them to make money. Tell Dudley city that this park is a black eye on the face of their city. Ask them to shut it down and give the animals to approved sanctuaries.